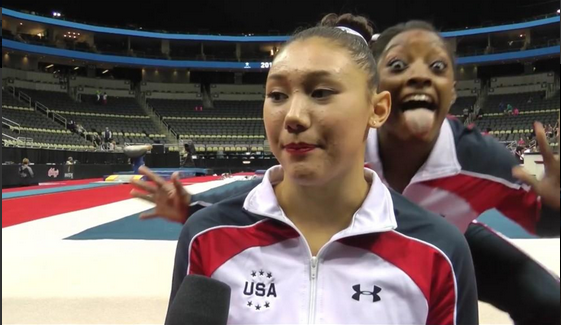 Kyla Ross enjoyed years of success as a junior all around competitor. But in these games, she come in as a team player. A table setter on beam and a middle routine on bars. Kyla did have a chance to make it into the bars finals, but hit her feet on the low bar in qualifications. Currently sitting as a reserve, her last chance for Olympic glory lay in contributing to the team. Kyla literally grabbed ahold of her destiny as she swung her way to a great bars routine. Then she tumbled through her beam routine, securely showing herself to be the Queen of Clean of both events. Kyla contributed key routines today during the team finals – a bars set that kept us ahead of the incredible Russians and a lead off beam routine that set the tone for a solid, no miss beam rotation. 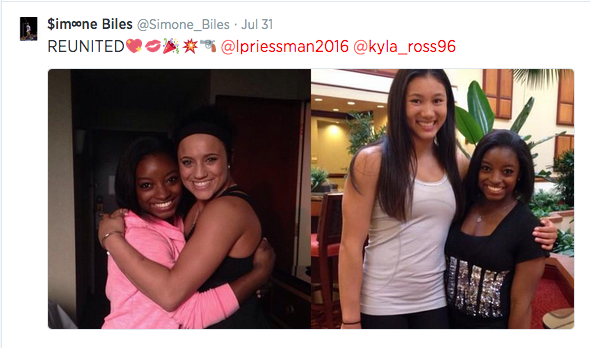 You would have never known that Kyla was a first year senior with the least amount of international experience. She came out today like a pro and walks away a gold medalist. Thank You Kyla for your incredible contribution and your years of hard work! Tomorrow is the day, the long awaited Women’s Team Final! Twelve countries qualified into the Olympics and now eight will move on to compete in the finals. Four of these countries will fight to be on the podium. The other four fought to get in the finals and are ecstatic for the opportunity to compete. You can watch the team finals live on NBCOlympics.com at 11:30 EST or on Prime Time NBC tomorrow night. Each team brings five gymnasts and puts up three gymnasts on each event. All three scores from each event count and will be added up to determine the final score. The top two scoring teams start on vault, the third and fourth on bars, fifth and sixth on beam and seventh and eighth on floor, allowing you to most easily compare. The USA had a strong performance in the qualifying round and qualified in first with a 181.863. They scored 1.4 higher than the second place team. In the world of gymnastics, that is a strong lead. They had a wonderful competition and really stood out on vault, their strongest event. There is room however for an even stronger performance as they had some minor mistakes on every event. Russia qualified in second with a 180.429. They had a great day. Their bars is just a beautiful thing to watch and they did not disappoint! Their biggest area for improvement is Aliya Mustafina who, if rumors are true, will be competing her amanar. She has yet to compete this or even show it in training since tearing her ACL on the vault last year. She also had a number of errors in her beam routine that could be cleaned up. Russia is a fierce competitor with beautiful gymnastics and they will come on strong. Don’t let the gap in qualifications fool you. They can challenge the USA. China qualified in third with a 176.637. China also had a shining bars performance, but had some problems on beam and floor. They also don’t have the difficulty on vault to keep up. They can definitely do better than they did, but it is unlikely that they can challenge for the gold. Romania qualified in fourth with a 176.264. Romania definitely did not have their best day. A team that is known for decades for their consistent, hit performances had a number or missed routines. Mostly, because their star Larisa Iordache has been battling an injury this week and did not perform to her usual standard. Catalina Ponor also had very uncharacteristic mistakes. 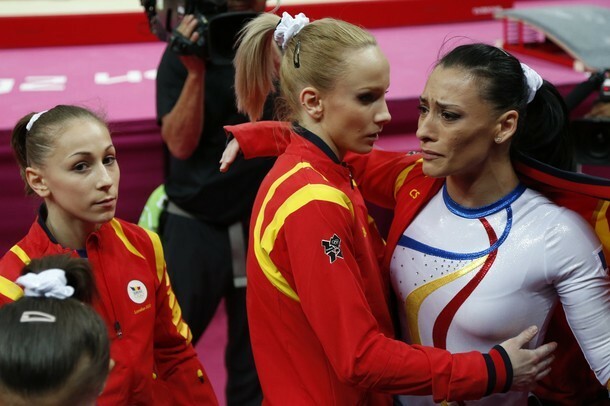 Neither Larisa nor Sandra Izbasa threw the more difficult vaults they have been training. It is unlikely that Romania will have another dismal performance. They are competitors and champions with decades of history of coming through in Olympic Finals. With a few more days or recovery for Larisa, a regular day of performance for Catalina, and all the vault difficulty being thrown, Romania will be right there in the battle for the gold. The other four teams six or more points behind Romania – Britain, Japan, Italy and Canada. But all of them fought hard to make it to team finals and are ecstatic for the chance to compete in the Team Finals. None more so than Britain, who will have the opportunity to bring down the house in their home crowd. Though Romania and Russia can bring on the heat, this really is the USA’s to loose. It should be a great team finals, with a lot of incredible gymnastics! I love Kyla’s smile. Hunting through her pictures, it is a reoccurring theme – this broad beaming smile that just makes you smile back. You don’t see it as often in her competitions, where she is more focused and serious. Or in her interviews. But a picture speaks 1,000 words. I think Kyla’s personality is summed up through her smile. I love Kyla’s attitude. “I am a contender.” She has said this many times in interviews. Not arrogant and assuming, but quietly confident. She knows what she can contribute to the team, and keeps plugging away, practice after practice, meet after meet to prove it. I love that Kyla is still a teenager. She has had plenty of international experience, but not yet enough travel and media attention to mature her beyond her years. Kyla seems like a normal teenage girl. It helps us remember that these girls are still just that – girls. Gymnastics wise, I love Kyla’s lightness. Every move she makes looks effortless, airy, like she tumbling or dancing through clouds. She is the Queen of Clean. She is dependable and it is easy to feel confident that she will deliver. Good Luck Kyla! 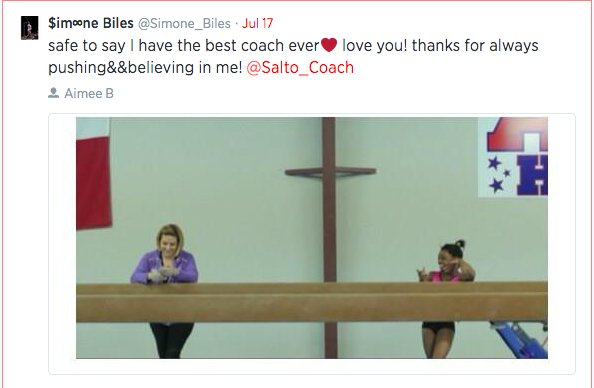 Thank you for your years of hard work and sacrifice to bring us your beautiful gymnastics. May the Olympics be more than you ever dreamed it would be! What do you love about Kyla? Do share!